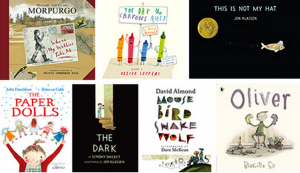 Have you had a change to look at the Carnegie and Greenaway shortlists yet? They look really exciting, with a wide range of themes and issues, as usual. 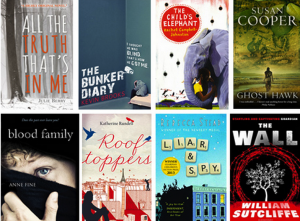 The Bunker Diary is already causing some controversy, with some librarians feeling that they are unable to let their Year 7 and 8 pupils read it. All the Truth is controversial too – looking forward to reading them all myself, looks like I have a busy weekend reading ahead of me! What are your thoughts? World Book Day – part four! 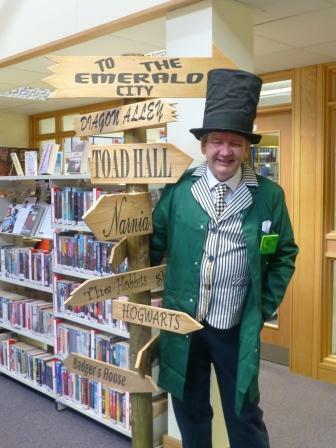 What did you do for World Book Day – Part Two! Well, my previous post had not been up on the site more than 10 minutes when school librarian Chris Routh at Leighton Park School, an independent school in Reading, sent me pictures and info about their World Book Day. These pictures were so beautiful that I had to share them with you all as well! This is what Chris told me: ‘WBD celebrations were part of our annual Book Festival, which also featured author visits and a day conference local school book groups about Writing for Teenagers. 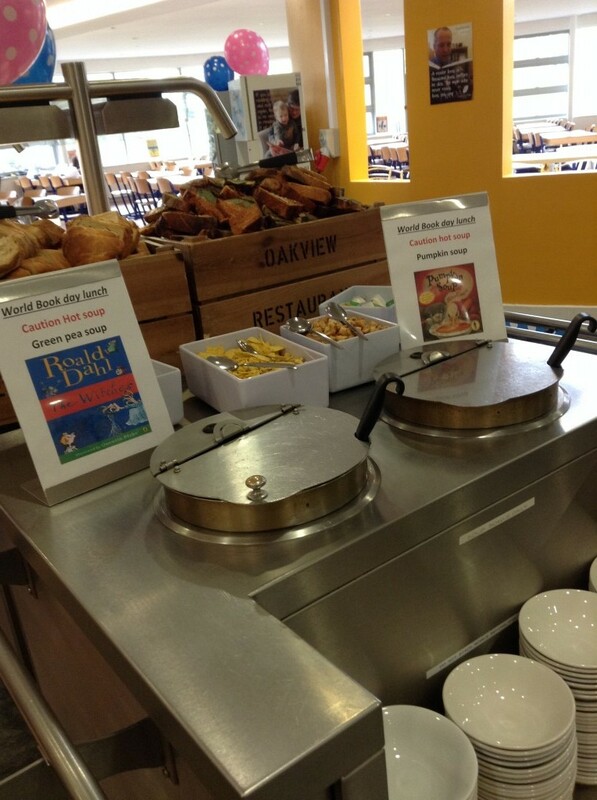 We celebrated World Book Day with the help of our fabulous catering team this year, who rose to the challenge of creating a book-themed menu for lunch-time. Each item on the menu was inspired by a book or book title. 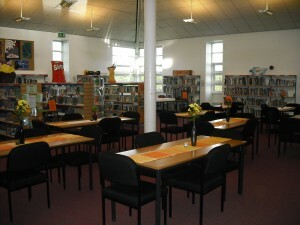 We supplied bunting and balloons and copies of our #caughtreading posters to decorate the serving area. 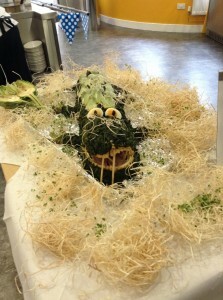 We were all surprised by the magnificent ‘enormous crocodile’ which greeted us at the entrance. 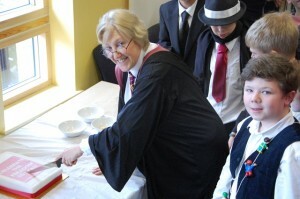 During lunch students and staff enjoyed the challenge of an international-themed ( points mean prizes!) 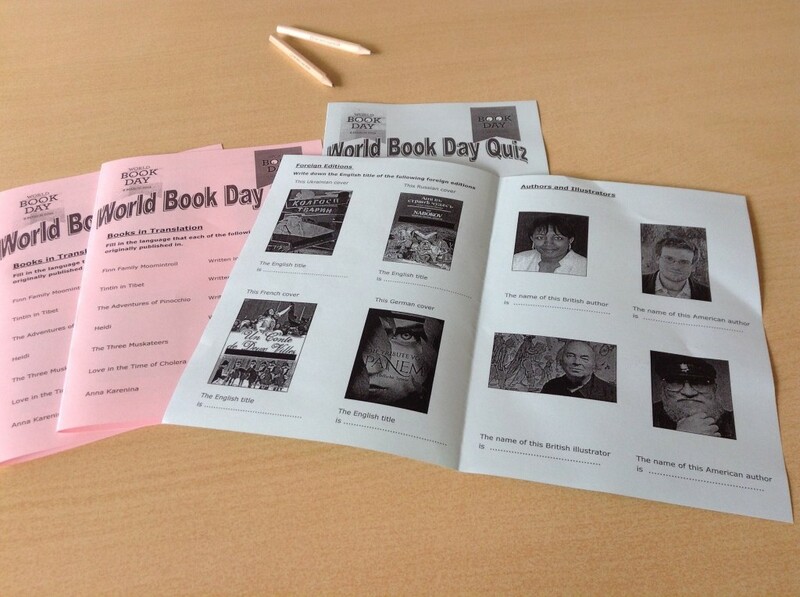 WBD Quiz. The event involved everyone in the school and created a great buzz of excitement.’ The photos are amazing, and the crocodile is fantastic! Looks like a great day! What did you do for World Book Day? On World Book Day, Eleanor Parker, the Librarian at St. James Senior Girls’ School in London launched an Inter-Form competition called ‘Judging a book by it’s door’. 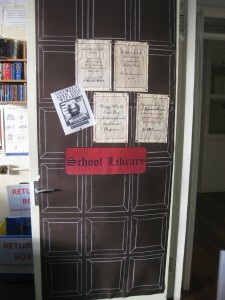 The challenge was to transform form room doors with a Harry Potter theme. This is what she told me: ‘I was amazed at the effort, creativity, detail and talent that had been put in to each door, it was truly awe-inspiring. Incredibly each one was totally different from the others. 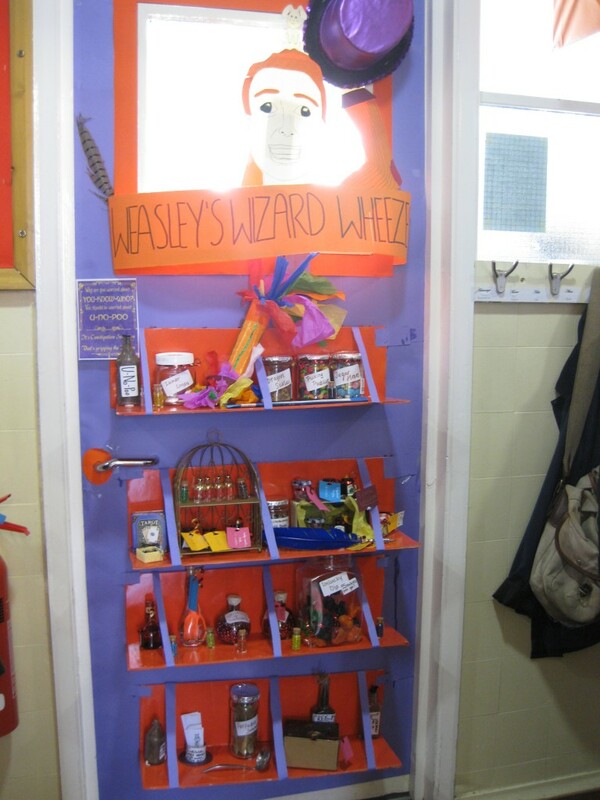 Doors included Weasley’s Wizard Wheezes, a 3D shop set up with bottles and jars; Spider Surprise with huge hanging papier mache spiders; our very own St James’ Marauder’s Map; a brilliant 3D flying car and a 3D serpent; quizzes and riddles to solve, and heaps of genuine Harry Potter props! 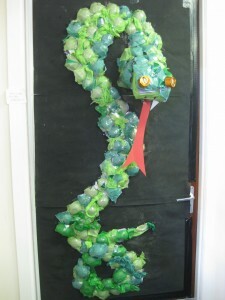 The pupils had so much fun setting up their doors and there was a real buzz as they all went around school looking at the other entries. I was so pleased that actually the whole school took part, including the Year 11s (with a bit of prompting from their form teachers!) AND the Sixth Form! Deciding the winners was one of the most difficult tasks I’ve faced so far as a School Librarian!’ Eleanor sent me lots of lovely photos, but sadly I had to choose between them and these are three of my favourites. 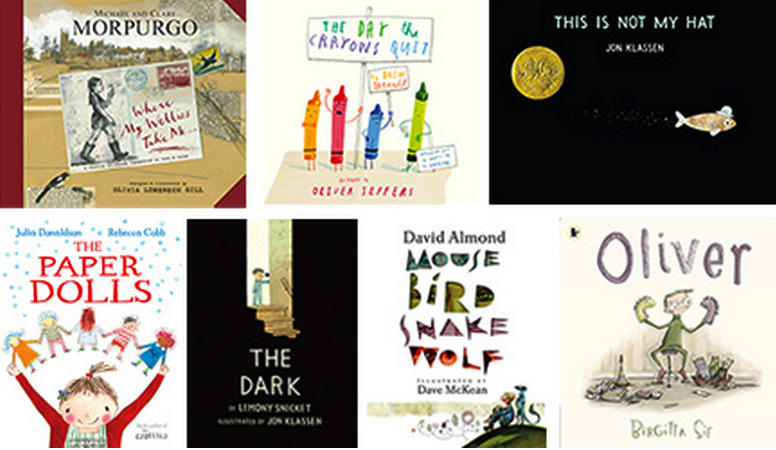 What a wonderful way to celebrate books – what did you do? Send me in stories and pics – would love to feature them! Are you working, or living near the Midlands? If so, this event may be for you. LibCamp Midlands is on the 14th June, from 10.30 – 3.30 at Malvern St. James. To book, or to find out more about the event, click here. Please also go on the wiki to suggest ideas for the camp. If you haven’t been on a Library Camp before – do go, they are really great, user run events. Tickets are free, but you will have to register for a ticket on the site to gain admission, to help with venue numbers. What are you doing in your school today? Do you have anything exciting to share with other Heart users – please send photos and stories to me, I would love to feature them here. I love the World Book Day site, there is so much on there! Or did you take part in the Robert Muchamore live webcast? How did that go? Share all of your World Book Day news with other users of the site – hope you have a wonderful day!